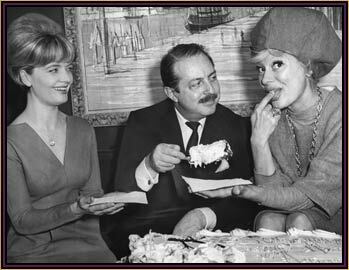 Florence Henderson, David Merrick, and Carol Channing at a party to celebrate his 10th anniversary as a Broadway producer. Her performance in the Broadway version of the show led to her triumph as Lorelei Lee in “Gentlemen Prefer Blondes,” in which she introduced several memorable numbers, including “A Little Girl from Little Rock” and “‘Diamonds Are a Girl’s Best Friend.” In 1954, she replaced Rosalind Russell in “Wonderful Town,” and in the next year, had her first big flop with “The Vamp.” In the late ’50s her nightclub act was so successful that it was turned into a one-woman revue entitled “Show Girl,” which played on Broadway in 1961. 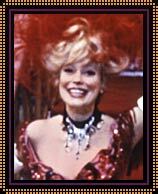 Three years later, she had her biggest success in “Hello, Dolly!”, as the matchmaker Dolly Levi, with a Jerry Herman score that included “So Long, Dearie,” “Before the Parade Passes By,” and the insinuating title song. She won a Tony Award for outstanding performance, but Barbra Streisand was preferred for the movie version. Channing’s larger-than-life personality is perhaps more suited to the stage than film, although she was hilarious inTHOROUGHLY MODERN MILLIE (1967). Other film credits include PAID IN FULL, THE FIRST TRAVELING SALESLADY, SKIDOO, and SHINBONE ALLEY (voice only). Source: Biographical information provided by MUZE. Excerpted from the ENCYCLOPEDIA OF POPULAR MUSIC, edited by Colin Larkin. © 2004 MUZE UK Ltd.